I am the most unprofessional blogger out there. A lot has happened since April of two years past (I told you I was a bad blogger). When we left off, Nibbles was returning from a minor-but-annoying pasture accident. Nibbles made a return to regular work and then, happily, I became pregnant. If you follow me on Instagram, you’ve been inundated with pictures of baby girl N who is now more toddler than “baby.” She was born in December 2016. Moreover, my husband took an exciting new job and we moved from Northern Indiana to North Texas in June of 2017. I kept my job and transitioned to full-time remote and we moved the family cross country. I made the difficult decision to find new homes for my horses: both Nibbles and my broodmare. After much searching for the right situation, they both moved together to a friend’s farm in Nebraska. I try not to hover but I know they are both in good health and enjoying the pasture puff life together on a private farm. It’s so easy to type that out but it really doesn’t illustrate how gut wrenching it was to come to the conclusion that it was the best thing to do. I’ve owned horses for 20 years and very much define myself as a horse person. I’m just presently a horse-less horse person. 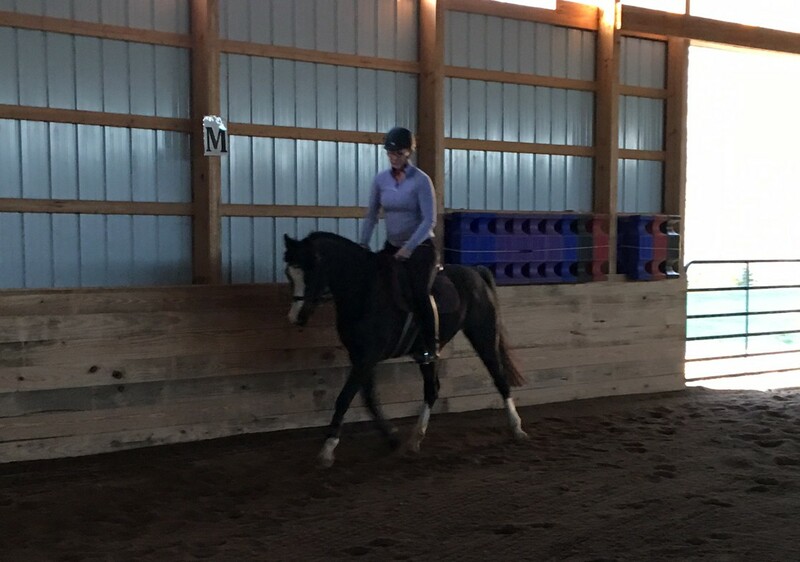 With two young children and a husband with a very busy job, I also have next to no time to ride so I am completely out of the saddle. I have been following along with many of your blogs for 3+ years now. I’d like to make a return to blogging one day when I have something horsey to blog about but alas today is not that day. I did want to post an update in case any of our old followers stumble across us again and/or you find me commenting and wonder who in the heck this person is. Ten thousand hours of practice is one hour every day for 29 years, never missing a single day.Or two hours a day, every single day, for fourteen and a half years, and so on. So, if someone wants to get to be supremely good at something, start now for years from now. Each tiny step of progress is built upon the tiny pieces already mastered, like building blocks. The impatient “non-learners” will struggle to avoid that unpleasant reality, The learners are different from the non learners in ways that the non learners will never comprehend, and the non learners will manage to find hundreds of excuses, and find ways to cast wide nets of blame for their inadequacies. The learners will be too busy in the struggle to improve to spend time on the blame game. You can check out Michael Jung’s ride on his super mare yesterday here or catch the livestream today here. She’s baaack. 7 weeks after the pasture incident, Nibbles is back in business. She still short strides a tiny bit on that left hind but she is by no means lame. Health care team and Trainer Elise gave us the green light to get back to work. At this stage, we would do more harm than good by letting her sit and her muscles atrophy. The verdict is that she really strained a combination of things in her back end. Trainer Elise came by and got on her for the first time before she left for Vienna. She was a bit silly on the lunge but all business when she threw a leg over. We’ll be taking it relatively slow as we get back to riding. My goal is to use poles and gentle hill work to help with her strength. I worked a lot of overtime last week (to the tune of about 70 hours) so she only got ridden two days. I popped on her yesterday in the 80 degrees weather which meant we got to ride in the outdoor arena for the first time. Nibbles goes a lot nicer outside than in. She’s just less fussy in the contact and relaxes a lot sooner. I’m hoping we can continue the outdoor trend. At the risk of jinxing things, I want to brag on Miss Thing a little. My first ride back after almost two months and Nibbles’ second, I planned to just putz around. Of course, she just so much darn fun that we ended up with a full WTC ride. 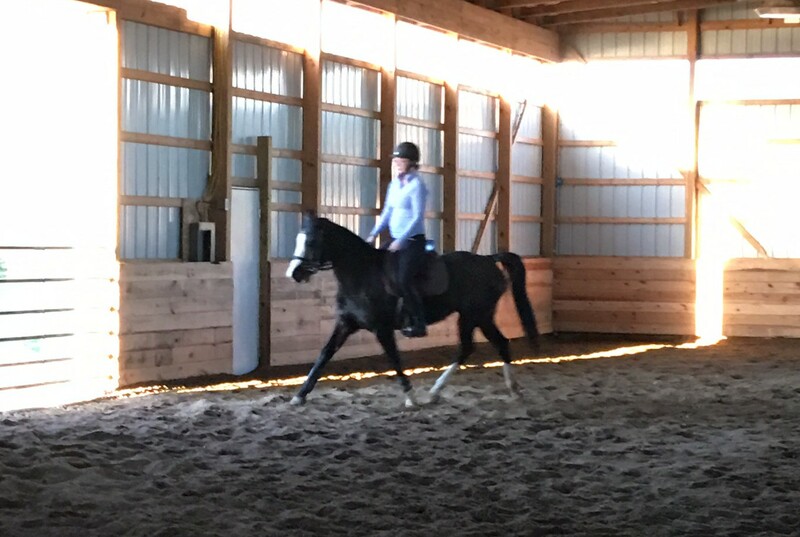 Besides getting a little zoomy in the trot near the end, she was foot perfect. The outdoor arena for her third ride back so far isn’t fenced in yet and is surrounded by woods and a giant field. It’s also full of a lot of nice jumps. Nibbles was even more rideable out there than inside. I mentioned it was 80 degrees yesterday. A week ago, we had a snow storm. I’d love to just get a little of real spring before we jump straight into summer in northern Indiana. The warm weather did mean I could finally start the process of scrubbing all the winter nasties off of Nibbles. I’ve been able to wash her legs and her tail but this was my first crack at a full body scrub down. She was pretty pleased about this until I insisted she let me spray her face. I’m evil, I tell you. To put it plainly, things are not going how I expected when Nibbles got home. But that’s horses, isn’t it? Nibbles has developed an upper respiratory infection that didn’t go away and required veterinary intervention. She has yet to develop a fever but she’s on antibiotics and banamine. She also got a shot of something which the name of escape me but it is supposed to boost her immune system. She was supposed to have 72 hours off from any work at all which she had. The runny nose and deep cough are improved but not gone. Anything more than a walk causes her to cough quite hard. So what I was hoping would be quick has now been lingering for more than a week. Horses. The post-injury repercussions are ongoing. In fact, I’ve begun to accept that this is in fact a chronic hip issue and we will at least be dealing with it for months if not years to come. We are into the 6th week since the injury occurred, two chiropractic visits and two massage sessions. She’s been lunged maybe four times just to see where we are at. The second massage session happened Monday while I was at work and, while I have the write up, I am talking to the therapist this evening on the phone. The gist of things was, well, she’s not worse. In some areas, there is less soreness but only marginally. She also reported that she needs to be adjusted by the chiropractor again for her right hip. This would be the third adjustment in 6 weeks which to me is telling us something – that she cannot hold the adjustment. At the walk and trot, she is sound. She cannot physically canter to the right. She will crossfire behind for a few strides then nearly fall. Horses. might you have a cookie over there? I’m not getting back on her yet. If she cannot walk, trot and canter on the lunge I do not think it is prudent to be riding her. Sure, I could probably get on and walk around but in my mind, my time is better spent doing intentional rehab from the ground. Massage will help. Things like backing up, cat stretches (where they tuck their pelvis), and ground poles (eventually cavaletti) will help. I don’t know when the chiropractor will help again (ie. she can retain the adjustment) and I do not have the $$$$ to throw at diagnosing exactly what has happened (ie. extensive diagnostics in the clinic that will likely be inconclusive according to my vet). I will continue to massage and rehab which I have been doing for three weeks now. Ultimately, I don’t know what the future will hold or what timetable we are looking at. This may be a case of let her be a pasture puff for a while then reevaluate. I’m sad. I’ve fluctuated between angry and disappointed. We are investigating small claims court as the vet bills have continued to mount but it may not be worth the time/effort. She was not insured before the accident. I’m slowly accepting the new reality that I don’t have a horse to ride/train for now. Hopefully time will heal all wounds. On the positive side, we love the new barn and not riding means I don’t need a new saddle immediately… Horses. Nibbles was moved to the new barn on Saturday, March 19. The new BO and her family came to pick us up. Nibbles marched right on the trailer and we left without a backward glance. She settled in almost immediately. This is a small, fairly private farm with a handful of boarders who found the place like me through word of mouth. They don’t advertise and they offer a very high level of care. I quite seriously asked this BO if she was crazy before making the decision. We talked at length about her expectations and mine and I feel very good moving forward into this new arrangement. I also went to look at two other places but decided this one best suited our needs. Bonus: it’s only 20 minutes from our house as opposed to the 35 minutes of the old, crazy barn. We have one week left of no riding before we will test the waters. I lunged her for 20-25 minutes on Saturday and she looked super. She was a little sore for the mini massage I gave her but really enjoyed her stretches. I don’t have a saddle that fits so we’ll see how this goes. I have my eye on a few that I’d like to take on trial but saddles aren’t cheap and I have a small stack of vet bills lately. I know everything will work out in time. For now, I am so happy and feel like I can exhale at the new barn. The first night, the new BO sent me several photos of Nibbles in her new stall (she is going from being out 24/7 to having a stall with private turnout). The next morning, I got a video of her eating breakfast and snuggling the BO. Talk about a stark contrast between BO’s already. No indoor wash stall. They are finishing two outdoor wash stalls that are very nice with the overhead hose guy and hot water. Crazy barn had no wash stalls and no hot water period. Limited turnout space. They are clearing 10 more acres but for now it’s 8 horses on 6ish acres so turnout is rotated. No immediate access to trails. Not a massive deal but the crazy farm was surrounded by a ton of farm land we were supposedly allowed to ride on. The “missing” list is short and nothing was a deal breaker. I am paying more now but I think I am gaining so much more than the increase in price reflects. Large outdoor arena. Fencing currently being finished but footing is well established. That’s the short version. The long version is that the BO lied to me about Nibbles having another incident in the pasture and came to me only to tell me because her conscience wouldn’t let her keep it to herself anymore. Mind you she didn’t lie just by omission – I specifically asked her if anything else happened. She told me no and went so far as to have two staff members tell me no as well in a group message. 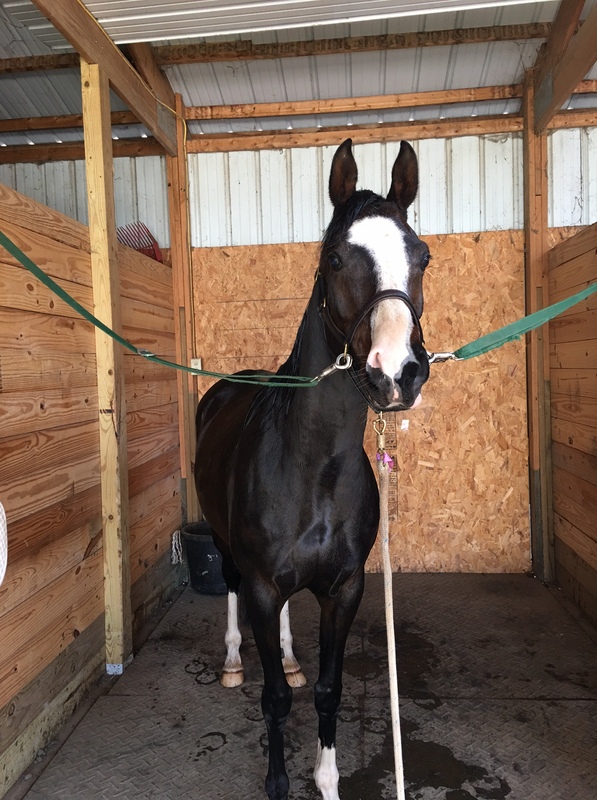 This led to a conversation at the barn which she sat down and had in front of other boarders in which she told me I thought I was perfect, that I was a critical person, that my horse wasn’t desensitized enough, and that if I was a “bold rider” I wouldn’t even notice things like dirt bikes. She also defended why she doesn’t supervise her children at the barn (five of them, ages 2 – 9) and why she not only wouldn’t prevent them from riding them in the pasture in the future but why she would be letting them do it without supervision. She went so far as to bring religion into it (a special level of crazy), to try to use reverse psychology (“What, so now I can’t use my tractor on the farm if it scares your horse?”), to guilt me for not knowing enough about kids (lolz), to tell me that we couldn’t prove that the fall is actually what injured the horse, and that she’s had issues like this in the past and sometimes people just aren’t a good fit for her style of boarding. I went into my conversation with her looking for resolution and to move forward with mutual respect and honesty. I left the conversation completely shellshocked at her lack of professionalism. She truly believes what she is doing is right and acceptable and that she is doing what her conscience is telling her to. She also believes this is her home first and her business second and she obviously treats it that way. I’m very proud of myself for never losing my temper or stooping to her level of name calling, guilting, and theatrics. I stayed very calm and logical and when it became clear that I could not continue to pay her for a service she wouldn’t provide, it was time to leave. The good news is that I have a new barn lined up. Sometimes when a window closes, a door opens. Can’t wait to share more with you guys, just finishing a couple things first!